As citizens around the world endure Internet censorship of all types, a Japanese university has stepped in to level the playing field. Whether you’re in Iran or China and blocked from YouTube, Twitter or Facebook, or in the UK desperate to get back on The Pirate Bay, KAT or H33T, a new tool from researchers gives instant access to dozens of VPN services. Not only is the system simple to use, but it’s also completely free. No matter which country you live in there are always people in authority seeking to limit which websites you’re able to view. Admittedly some sites are quite rightly deemed repulsive to society in general and 99% of the public have few problems with them being hidden away. However, the blocking of ‘normal’ sites is much more controversial. China is infamous for its Great Firewall and its censorship of anything it pleases from Twitter to YouTube. Iran also has concerns that its citizens’ minds will be influenced by Western thinking via the web. Overall, oppressive regimes tend to see some websites as having a destabilizing effect, so they censor them to maintain control. In recent times the notion of website blocking has become fashionable in the West too, mainly because certain domains are viewed as offensive to the music and movie industries. The Pirate Bay is blocked in many countries and just this week the UK added another three sites to its ISPs’ filters – KAT.PH, H33T and Fenopy. But, as mentioned countless times in the past, these filters represent mere temporary roadblocks for the determined and today we bring news of an exciting project that allows almost anyone to access any site they like in seconds. Best of all, it takes just a few minutes to setup and it’s completely free. 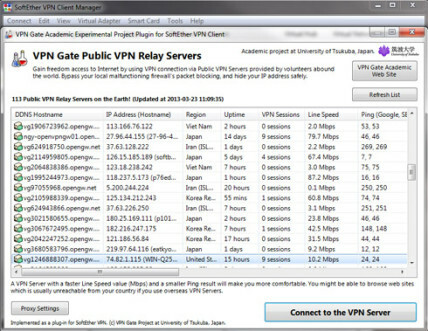 The Graduate School of University of Tsukuba, Japan, has just launched the VPN Gate Academic Experiment Project with the aim “to expand the knowledge of Global Distributed Public VPN Relay Servers.” We’re very happy to help them with that today. Volunteers have given the University access to dozens of VPN servers located all over the world which people can access from pretty much any device running Windows, Linux, iOS, Android and more. No sign up or user registration is needed. Once connected the user’s IP address is hidden and switched for one issued by the VPN of their choice selected from dozens around the world. Several protocols are accepted, such as L2TP/IPsec, SSTP and the popular OpenVPN, but things get really streamlined for those who select the SSL-VPN option. This requires theeasy installation of the Windows freeware client SoftEther VPN but it’s straightforward and only takes a couple of minutes. The beauty of running the client (which is also developed by the University and will soon go open source) soon becomes apparent. Not only does SoftEther offer SSL-VPN tunneling via HTTPS to pass more easily through NATs and firewalls, it has another trick up its sleeve. The client comes with a nifty pre-configured plugin which displays a list of all the available VPN servers offered by VPN Gate (see below). This enables the user to activate, disconnect, or switch between VPNs with just a click. This means that there is no need to set up each VPN connection manually in an operating system, although that can be done if the user prefers. Want to unblock The Pirate Bay, KAT.PH or H33T in the UK? Easy, just select any server that isn’t in the UK and preferably outside Europe. Want to access YouTube in China? Simple, just access any non-domestic VPN server. US citizen who needs to use Hulu overseas? Fine, just pick a United States server. UK citzen who needs to access the BBC iPlayer abroad? A UK server will provide the solution. Once a server is selected and connected to the client, simply use your regular browser and other Internet applications as usual and traffic will be diverted through the VPN. TorrentFreak carried out some basic tests yesterday and got some decent results. We successfully unblocked all of the blocked torrent sites in the UK, accessed Hulu from outside the US, and watched the BBC iPlayer and TVCatchup services from outside the UK. Also, since the people at VPN Gate apparently have no problem with people using the service for video transfers (they mention YouTube specifically), we conducted some limited BitTorrent runs on half a dozen servers around the world. In each case we connected to a VPN server via the SoftEther Client and carried out tests with a service such as TorrentIP to ensure that our IP address when using BitTorrent had actually been changed. All but one of our tested servers worked fine while another appeared to block torrents. As might be expected, performance changed from server to server but in each case browsing and transfer speeds were more than acceptable for a free service. Each server shows its available bandwidth so picking one with more tends to yield better results. That said, we tried a couple of slower ones and they performed just fine too. While VPN Gate offers anonymity to a point, they do keep connection logs for around three months. In common with most other VPN services they do not monitor your activities but will comply when ordered to do so by the local courts, in this case those in Japan. However, each VPN server has its own logging policy and many appear to delete logs after a couple of weeks, if they keep them at all. To give an outline of how the logging might affect users in real-life situations, we can look at a few scenarios. If a US citizen carried out file-sharing on a US VPN server, he might be logged by those carrying out six strikes in the US. However, if that same user selected a server overseas, he would not be monitored by six strikes. Equally, an Iranian or Chinese citizen looking to carry out activities frowned upon by his or her government would be advised to use servers located outside their respective countries. Finally, please use the services responsibly – respect the volunteers offering their services and consider becoming one yourself. If you have a Windows computer and can offer your bandwidth, click here for more information.